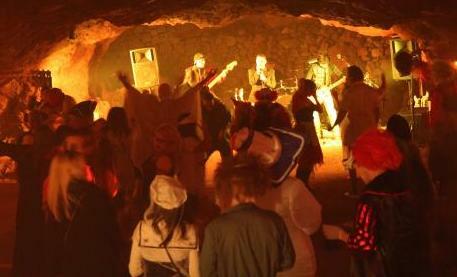 Are you looking to hire a live band for your Halloween party? The NoteWorthy band will make your Halloween party fantastic. The band members can all wear Halloween costumes to make your event memorable. The band can play songs to set the mood. Horrified at the idea of throwing a Halloween bash? Fear not! The band has made a list of everything you’ll need for a frightfully fabulous event! Candy and loot bags Set out glass jars loaded with different types of candies and mini scoops, and let guests fill their own goodie bags to take home. Pick up a variety of treats, from gross gummy body parts (feet, ears, and eyeballs) to classics like Pixy Stix and Bazooka. Punch bowl No Halloween party would be complete without a spooky punch. Serve one that’s blood-red, ghoulish green, putrid purple, orange, or black and use dry ice to create an eerie mist. Napkins, plates, utensils, and tablecloths Keep a stash of these essentials in colors and patterns that match your scheme. A festive covering will make your everyday tables party-ready in an instant. Party City has a wide selection of Halloween-themed goods, along with supplies in basic colors. Serving dishes – Count your platters beforehand to make sure you have enough space for all your party treats. Make a list or label each dish with a Post-it note or masking tape to keep track of which food goes with which platter. Beverages and cups – If you’re serving alcoholic drinks, plan on three to four cocktails per guest for a two- to three-hour party. And don’t forget to include something alcohol-free and fun for the teetotalers and kids in your group. Make sure to have heatproof cups on hand if you’re serving anything hot, like mulled cider. Appetizers – Serve plenty of savory items to balance out all that Halloween sugar. For less stress, make as many items ahead of time as you can. Desserts – Cupcakes and cookies are easy for guests to eat and fun to decorate for Halloween (for example: cookies shaped like ghosts and cats and cupcakes topped with orange frosting or mini pumpkin candies). For even more holiday spirit, make pumpkin cupcakes and decorate them with candy corn. Or try using Halloween candy in creative ways: Serve a Twix cheesecake pie or make chocolate bark decorated with candy corn. Setting the Scene – Carved jack-o’-lanterns Greet guests with a lineup of these lighted hosts on your stoop or porch. Pumpkins and decorative gourds Display these in clusters around your home. Try different ways of dressing up your pumpkins—spray them with metallic paint for a golden glow or use chalkboard paint to make faces or write messages. Fake cobwebs and spiders, paper bats, balloons, and other decorations Hang cobwebs and spiders in the corners of your room, let bats and banners dangle from the ceiling, and go all-out with festive or frightening décor to create the right atmosphere. Shop for supplies from any decent arts and crafts store, which has a wide selection of creepy goods—bags of bones, ghosts, and tombstones. Halloween is one holiday when it’s OK to be over-the-top. Candles – Scatter lots of candles throughout your party and group pillars of varying heights and sizes together. Display a candelabra for dramatic flair. Halloween movies – Play classic horror films in the background (on mute so the sound is not distracting to the party) to get guests in the mood, such as Friday the 13th, The Exorcist, or, naturally, Halloween. Costume accessories – Whether you’re hosting a costume party or not, it’s always fun to have some extra dress-up items around. Set out some masks and wigs, plastic fangs, hats, a cape, a tiara, a feather boa—whatever suits your fancy—and let your guests get creative. Camera – Don’t forget to recharge your batteries and clear space on your memory card before your Halloween bash. Designate a friend or family member as the party photographer so you’ll have one less thing to worry about.